National Assembly seats won in 2018 general election. 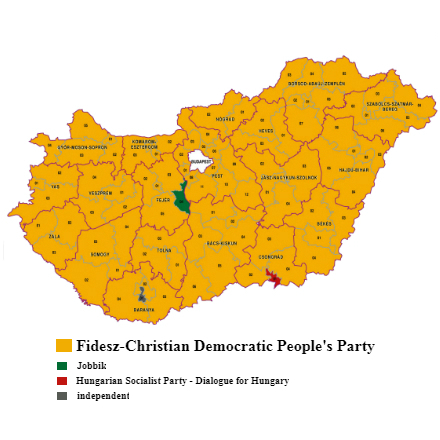 The Fidesz–Christian Democratic People’s Party (KDNP) alliance won its third-consecutive two-thirds majority in the National Assembly of Hungary in the general election held in the county on April 8, 2018. Fidesz-KDNP won 133, or 66.8 percent, of the 199 seats in the National Assembly. This two-thirds majority will again enable the governing alliance to pass so-called cardinal laws (sarkalatos törvények), including those amending the Fundamental Law of Hungary, without support from National Assembly opposition parties. 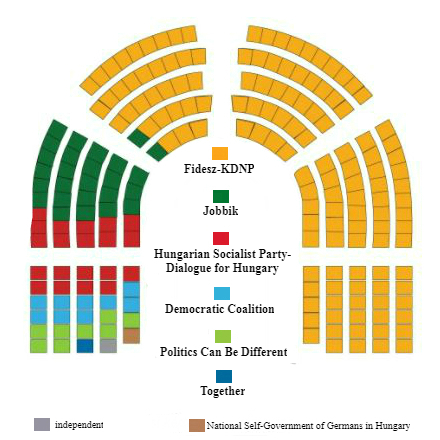 Five opposition parties won 64 seats in the National Assembly: the nationalist party Jobbik won 26 seats; the Hungarian Socialist Party-Dialogue for Hungary alliance won 20 seats; the social-liberal party Democratic Coalition won 9 seats; the green-liberal party Politics Can Be Different won 8 seats; and the liberal party Together won 1 seat. An opposition independent, former Hungarian Central Statics Office director Tamás Mellár, and the National Self-Government of Germans in Hungary won the remaining two seats in the National Assembly. In comparison to the 2014 National Assembly election, Fidesz-KDNP won the same number of seats in the 2018 National Assembly election, while the Democratic Coalition gained five seats, Jobbik and Politics Can Be Different gained three seats, Together lost two seats and the Hungarian Socialist Party and Dialogue for Hungary, which contested the 2014 election separately, lost ten seats. Of the 199 seats in the National Assembly of Hungary, 106 are derived from elections between individual candidates in an equal number of electoral districts in the country, while 93 are derived from votes for parties at the national level. Results of 2018 National Assembly election in electoral districts outside Budapest. In the 2018 National Assembly Election, Fidesz-KDNP candidates defeated their opposition rivals in 91 of 106 electoral districts in Hungary. Fidesz-KDNP candidates won in 85 of 88 electoral districts located outside of Budapest, though won in only 6 of 18 electoral districts in Budapest. 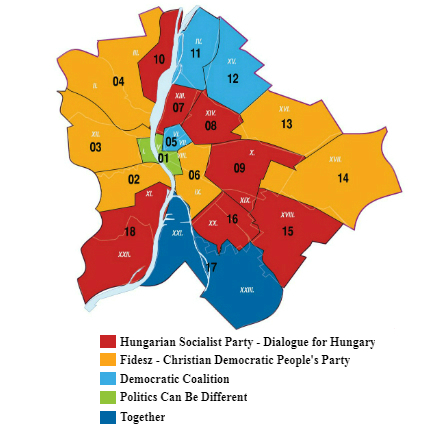 Opposition candidates defeated their Fidesz-KDNP rivals in 14 electoral districts: Hungarian Socialist Party-Dialogue for Hungary candidates in 7 Budapest districts and 1 Szeged district; Democratic Coalition candidates in 3 Budapest districts; Politics Can Be Different and Together candidates in 1 Budapest district each; a Jobbik candidate in the single Dunaújváros district; and independent candidate Tamás Mellár in a Pécs district. Fidesz-KDNP won 49.6 percent of votes cast for parties in the 2018 National Assembly election, while the seven main opposition parties won 49.2 percent of votes and minor parties, most of them so-called sham parties (kamupárt in Hungarian) that participated in the election exclusively in order to obtain government campaign-funding, received 0.2 percent of the votes. Of the seven main opposition parties, Jobbik received 19.2 percent of all party votes cast, while the Hungarian Socialist Party-Dialogue for Hungary alliance received 12 percent, Politics Can Be Different received 7.1 percent, the Democratic Coalition received 5.4 percent, the Momentum Movement 3.1 percent, the Hungarian Two-Tailed Dog Party 1.7 percent and Together 0.7 percent. Fidesz-KDNP won 42 of the 93 National Assembly seats distributed proportionally to parties via the party lists based on the number of votes cast for the parties at the national level plus the number of so-called fragmentary votes (töredékszavazat) cast for candidates affiliated with the parties in the individual electoral districts—that is, those votes cast for losing candidates in the electoral districts as well as those cast for winning candidates beyond the one vote needed for victory over the second-place candidate. Opposition parties won 50 of the 93 National Assembly seats distributed to parties based on the number of votes cast for parties plus the number of fragmentary votes. Jobbik won 25 of these 50 seats, while the Hungarian Socialist Party-Dialogue for Hungary alliance won 12, Politics Can Be Different won 7 and the Democratic Coalition won 6.
the National Self-Government of Germans in Hungary won the remaining seat in the National Assembly distributed via party votes. The opposition parties Momentum Movement, the Hungarian Two-Tailed Dog Party and Together failed to receive the minimum of five percent of all votes cast for parties in order to gain seats in the National Assembly via party and fragmentary votes. Fidesz-KDNP won 96.2 percent of the 224,564 votes that Hungarian citizens who do not have a permanent address in Hungary cast via mail in the 2018 National Assembly election. Around 60 percent of such Hungarian citizens who registered to vote via mail were from the two countries surrounding Hungary that permit dual citizenship—Romania and Serbia (source in Hungarian). A total of 70.2 percent of all eligible voters in Hungary participated in the 2018 National Assembly election, up from 61.2 percent from the 2014 National Assembly election. Source of data (in Hungarian): website of the National Election Office. Last updated: May 10, 2018.